That’s what Jack and Annie learn when the Magic Tree House whisks them back to Elizabethan England. There they meet William Shakespeare himself—one of the greatest writers of all time! But Mr. Shakespeare’s having a hard time with some of the actors in his latest show. Are Jack and Annie ready to make a big entrance? Or will it be curtains for Shakespeare? 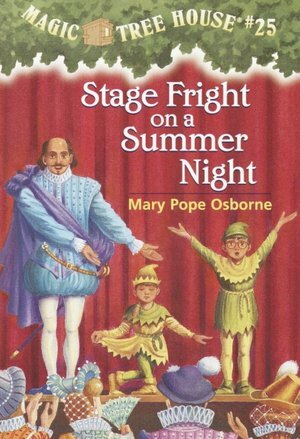 Jack and Annie travel in their magic tree house to Elizabethan London, where they become actors in a production of A Midsummer Night’s Dream and try to rescue a tame bear. This was a cute story. Annie shows a very sensitive side and Jack overcomes a fear.